In this classic family quiz game you spin the wheel to get a letter of the alphabet. A question card is picked, and the answer to the Tell Me question must begin with that letter (like "I Spy") ! There are lots of questions, at 2 difficulty levels for different ages ! The 55 question cards each allow different winning answers for each letter of the alphabet. Then you start again. 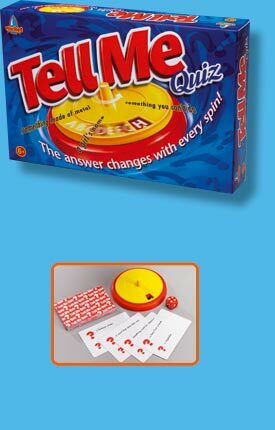 It's a load of fun for 2 or more players aged 6+ ! Age Guide: Adults & children over 6 years. Contents: Question cards, letter spinner and instructions. "This is game is very fast pace and fun. You need quick mind and quick fingers. A great game to play with friends and family alike". Submitted by M.A.